As a coach and mentor, challenging people is a natural part of my work, and sometimes they are in the form of tough messages. Not always though, the messages go down well with the recipient. This is particularly the case for conversations with startup entrepreneurs that I see are stuck in the trap of what I call “just do it” leap of faith product development. For years I’ve struggled on thinking how best to get through to people in such cases and that has led to my thinking behind defensive routines, which I will shortly publish a dedicated article on the topic. 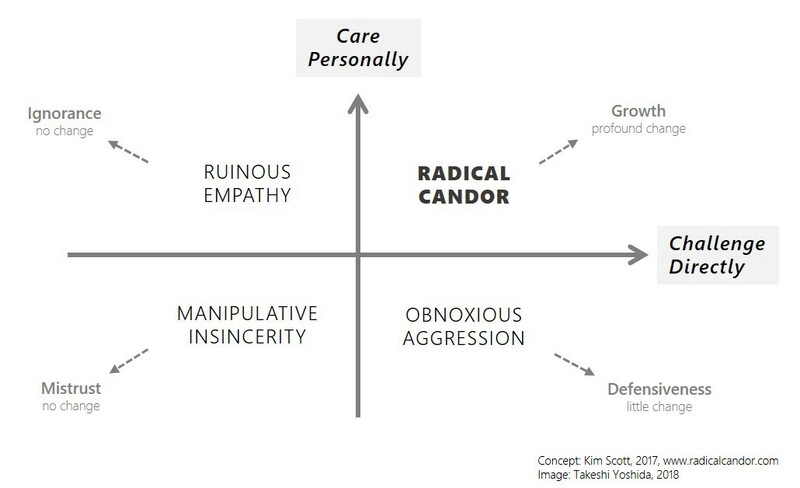 Among the few models and tools that I will introduce in this soon-to-come-article, one of my favorites is Kim Scott’s “Radical Candor”. I use it as my go to feedback routine with people. Kim Scott, a former Apple and Google veteran and serial startup entrepreneur, came up with this framework through her own many experiences of office dramas. Scott’s idea is that guidance is praise and criticism. And the best way to deliver that is in a balanced way of caring personally, while challenging directly. It takes an effort to get this balance right, which Scott calls the state as Radical Candor, and if unbalanced, the following happens. If you care for the person you are speaking to, but are timid or afraid to provide direct criticism, then you are being “ruinously empathetic”. Scott says “patronizing or insincere praise will erode trust and relationship just as much as harsh criticism”; ruinous empathy is as bad as obnoxious aggression. Actually, Scott says its worse: in obnoxious aggression, at least you convey the critical feedback, whereas in ruinous empathy, you sweep it under the rug. If you care for the person — “if you give a damn” — you should say it! Feedback is critical to a person’s growth, and if you’re not giving quality feedback openly, even at the risk of creating tension and discomfort to the person, you’re not being helpful. And it’s not helpful for the team too: you’re letting poor performance slide and that’s sending a message. A stranger also waiting to cross looked over at me and said, “I can see you really love your dog.” In the two seconds it took him to say those words, he established that he cared, that he wasn’t judging me. Next, he gave me a really direct challenge. “But that dog will die if you don’t teach her to sit!” Direct, almost breathtakingly so. Then, without asking for permission, the man bent down to Belvy, pointed his finger at the sidewalk, and said with a loud, firm voice, “SIT!” She sat. I gaped in amazement. He smiled and explained, “It’s not mean. It’s clear!” The light changed and he strode off, leaving me with words to live by. Think for a second about how this might have gone down. The man could have easily said something judgmental (“you have no right to own a dog if you don’t know how to take care of one!”) and thus left me defensive and unwilling to take his simple but essential advice. Instead, he acknowledged my love for the dog, and explained why his recommendation was the right way to go (not mean, clear!). Scott subsequently admits that the powerful tone of the stranger’s voice may have evoked her defensive routine, and this shows how Radical Candor so closely borders with obnoxious aggression. Being Radically Candid is intricate business. Whether or not you can successfully deliver criticism without discouragement depends on you, but it also depends on the other person. Even if it was somewhat successful, there probably will remain some “awkwardness” on both sides. You’re going to have to get used to it. 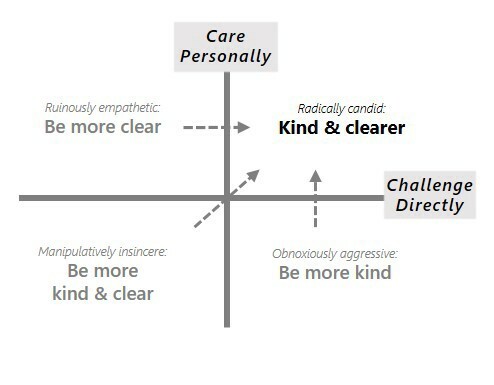 On the first axis of “caring personally”, find an action word or two that’s easy for you to recall. Does “caring personally” mean “kindness” to you? Or would the word “sincerity” be more fitting for you? Find the right word that you can whisper to yourself when you’re being too “tough” or “stern” (or whatever that’s your antonym to “caring personally”). Notice the difference in the following? Your work is not good enough. Obviously, the first one is better criticism as it’s “clear” and “specific” that the person’s work is the problem, not the person themselves as in the second one, right? In actuality, if somebody produces sub-par work, our typical first feelings will be disappointment on the person themselves, not on their work. This contrasts to when we ourselves do sub-par work: we typically will think “I didn’t have enough time”, or “I was distracted”, and not “I’m not good”. Fundamental attribution error is the tendency for people to unduly judge others on their character and not on situational factors in explaining that other person’s behavior; i.e. we tend to give a break to ourselves but less to others. We should be very conscious that, because of fundamental attribution bias, there’s a dangerous tendency for our criticisms to become personal character attacks, even if that was not the intention at all. And people never react well to personal character attacks. With this awareness, be very specific and clear on what you are criticizing: is it the person’s action or behavior, or the person’s character? When a conversation gets heated, remind yourself, defensive routines evoke defensive routines. What originally was “I have some helpful advice that I can give” can quickly escalate into “This person isn’t listening, I need to get this right.” Your friendly advice is met with reaction, and now your need to be right is activated. We have a strong need to be right; it’s a defensive routine stemming from the anxiety of not being in control. We justify that the “advice” we want to give is really helpful, so it needs to be heard. It’s for the benefit of the other person. But the truth is, at this point the “advice” itself doesn’t matter; all that matters is to drive or manipulate (for people who have strong preferences to avoid direct confrontation) the other side into submission. So much for being helpful. Our need to be right can be very damaging to relationships. We need to keep it at bay. Instead, our focus should be on doing the right thing. What you tell a person is less important than what you enable the person to tell you. This does not contradict with Scott in Radical Candor: Scott also makes it very clear that the nature of relationship with who you are speaking with is most important, and the conversation shouldn’t start with dishing out criticism. This is also congruous with many other teachings on good conversations, from the timeless wisdom of “listen first” to David Bohm’s “suspending assumptions”, and my favorite reference, Judith Glaser’s “Conversational Intelligence” (2014). Going into a dialogue requires an effort to set up an emotionally safe environment for the person you are speaking to, so that they can speak in their own “language” without fear of repercussion. Further, you should be ready to be “influenced”. 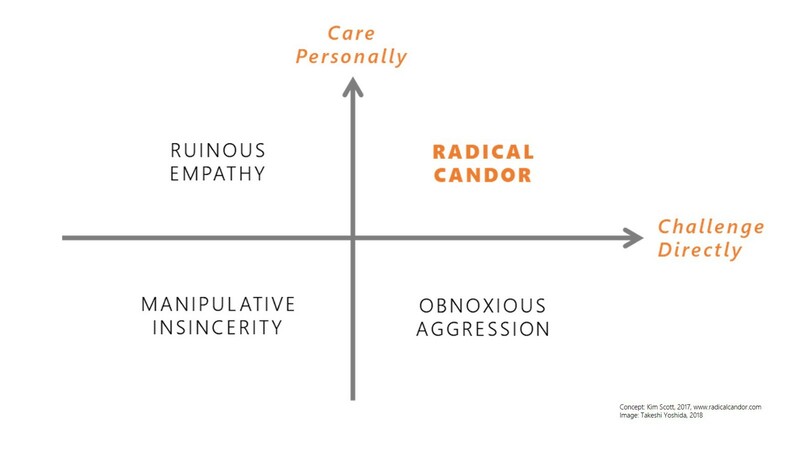 You have Radically Candid feedback to give, but telling that is not the objective of the conversation. Rather, what comes out of the dialogue through the Radical Candid feedback is more important. 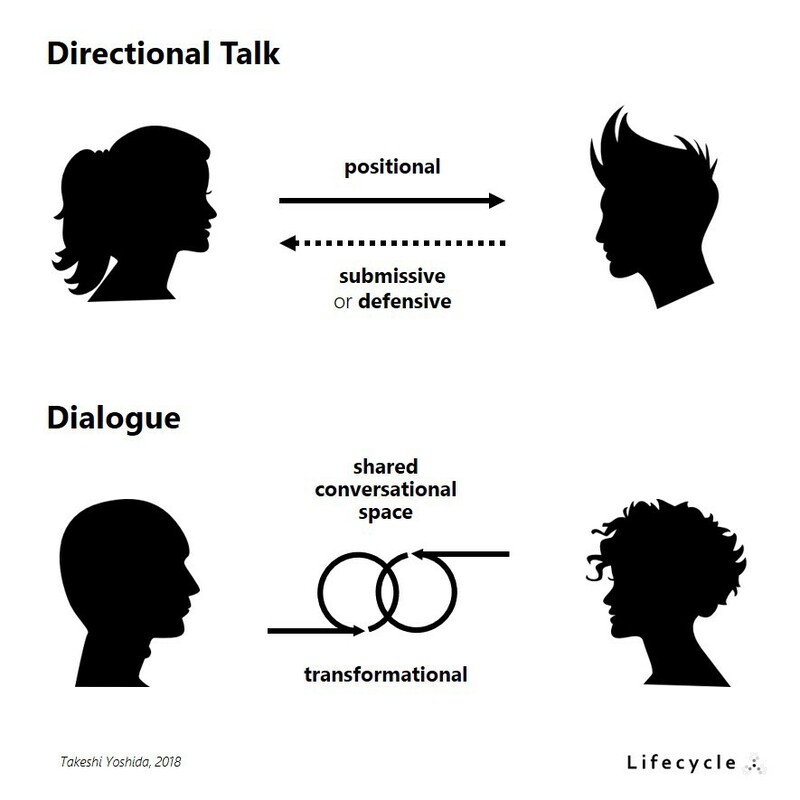 A good dialogue is transformational: there will be discovery, furthering of mutual understanding, possibly a new objective or agreement, and so on. Naturally, the change is on you too. I earlier wrote that “whether or not you can successfully deliver criticism without discouragement depends on you, but it also depends on the other person.” There’s actually two scopes to this: present and pre-conditional. How you deliver the criticism at the time of conversation is of course very important (and hence the pointers above). Meanwhile, how people take criticism also depends on their personal character, something that is a pre-condition. Some take criticism well, others react badly, and most of us fall somewhere in between but typically slightly more to the negative reaction side because of our innate defensive routines. I find this very much in line with what I also consider as one of the crucial objectives for leaders in learning organizations: to help people become mentally resilient. 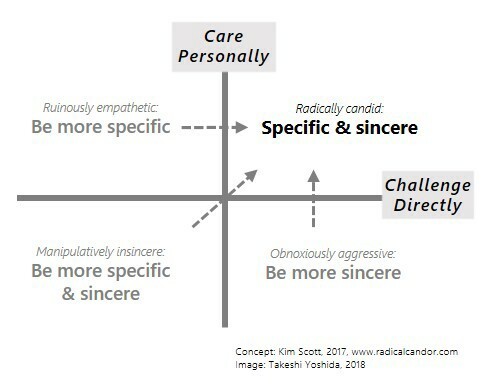 The key is to “care personally” — each person is different, we come from infinite diverse backgrounds, upbringing and experiences; many have worked in stressful environments, and not of all us have been blessed with the opportunity to work with reflective and deeply caring colleagues and leaders. Treat your peers with compassion and spread the empathy. In such an environment of emotional safety, people will be ready to be “challenged directly”, and take criticism in stride. Chief Coach & Founder @agile-od.com by Lifecycle. Author of series The Lean & Agile Practitioner, and The Reflective Leader & Learning Organizations.